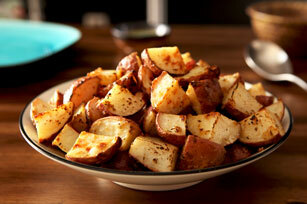 Red potato chunks are tossed in a mixture of Dijon mustard, Italian seasoning, olive oil and garlic, then roasted for an easy-and-delicious side dish. Mix all ingredients except potatoes until blended. Spread potatoes onto bottom of 13x9-inch pan sprayed with cooking spray. Add mustard mixture; toss to coat. Bake 35 to 40 min. or until potatoes are tender, stirring occasionally.